There is an abundance of video cutting software available on the Internet. The number of similar features offering software have increased beyond the break-even point with the users finding it extremely difficult to materialize their selection and with the increasing trend and usage of video cutting tools and their necessity in various tasks including making apt and to the point presentations, cropping a specific segment from the long video and many other essential yet straightforward activities. Hence, in today’s article, we will be handling the issue of selection of a good and easy to use Media Cutter software and help you reach a final verdict and perform the various activities with ease and in an efficient manner. The software which we will be putting under the X-Ray machine is Joyoshare Media Cutter. Let’s see what the reports reveal about the structure and the various parameters associated with the software. Regarding Joyoshare Media Cutter let’s see what the various parameters rate. The software is indeed User-Friendly to look at and handle from the perspective of a first-hand user. There are no delicate features that need explaining and in more simplistic language even a layperson can operate the software with ease and convenience and get the task done in quite an efficient way. So, concerning the ease offered to the users and the comfort experienced by the users the software can be rated 4/5. UI stands for User Interface and UX stands for User experience. These two features are the most critical parameters in defining the popularity and the influence of the software in a given region and the particular field within which the respective software offers its functionalities in. 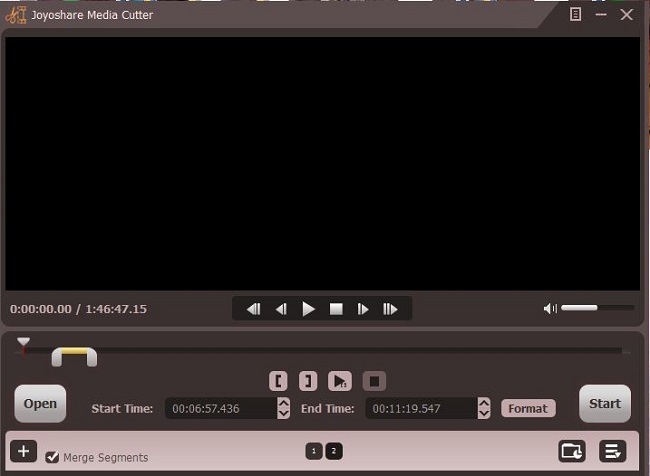 Joyoshare media cutter has a relatively simple User Interface with a small screen in the top which displays the video segments and then a tray bar having various play/pause and cutter buttons. Quite a simple right! Hence this is bound to make the user experience well. But that is not the case. The User design of Joyoshare media cutter is hassle-free to the extent it lacks many of the features that various others media cutter software offer. We will discuss those features in the upcoming pages. Just a handful of buttons indeed make the task of video cutting and sticking together the segments quicker and devoid of troubles but the software aims at a handful of features. This makes the User interface a little dull although simple and the user experience fluctuates between average and bad depending on the type of resources which the particular user wanted to use. Hence, about the UI/UX of Joyoshare Media Cutter, it would be appropriate to rate it 3/5. Another dominant parameter in increasing the graph of demand and traction of the software is whether the given software has been loaded an apt number of features or not. As troublesome seems the fact of a paucity of features in software, the same magnitude of concern is attached if there are a plethora of features in software. Hence the developer must make sure that the software offers the features which is well within the area of acceptance that being neither too fewer features nor too much which makes the users go in a frenzy over the complicated use of the software and eventually opt for another software over that one. With regards to Joyoshare media cutter, the number of features that have been offered by the software is indeed less. The features range from selecting a particular segment of video from the long video, encoding the video to a respective quality of clarity, combining two or more segments into a single segment and that’s all. Hence, the number of features is indeed less when compared to a full-fledged video editing tool like fading in/out, removing the noise in the background, increasing the exposure, brightness, RGB levels, merging audio with the video track and the list goes on. Joyoshare offers an insufficient number that limits the users to only cutting the video. Hence if that’s all a user wants then the software is indeed good and completely easy to use but if the user wishes to accomplish something more from the software, then Joyoshare doesn't stand a chance to satisfy the users. So, in this category, it would be apt to rate Joyoshare as 3/5. Before going to the final verdict let’s see some of the reviews on the official site of Joyoshare. The reviews are indeed quite less in number but are positive. The area of appreciation is mainly the convenience and the user-friendly design of the software which eventually we also accorded an excellent rating. 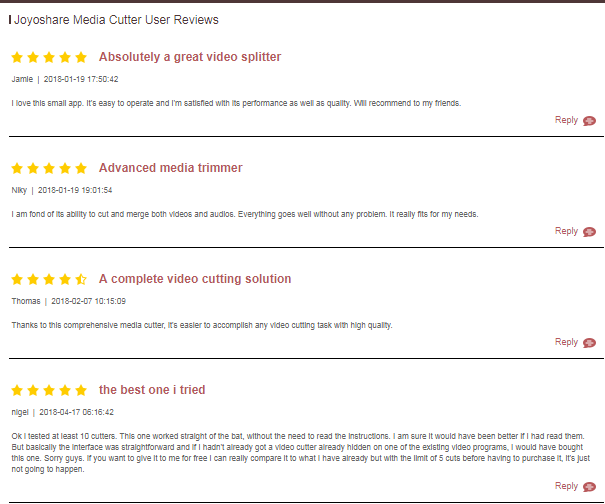 Joyoshare media cutter is a recommended product based on the nature of the task which the user performs. If the task is limited only to very basic simple tasks such as cutting and merging of a few segments, then the user can opt for the software with eyes closed. However, the free version of the software offers only 5 cuts which is indeed a drawback. You can avail and enjoy all the features of the software by paying an amount close to $30.